8 III What Is Love? "And from this confusion I dream'd up a grand illusion it's my Tenement Symphony ..."
Tracks 1 & 3 mixed at Maison Rouge, tracks 7, 8, 10, 11 mixed at Sarm West Studios. Track 7 programmed at the Fishermans Room, Berlin and at Sarm West Studios. Tracks 7, 10 & 11 orchestration recorded at CTS Studios. Rhythm track in track 7 taken from 'Red Summer' by 'Sun Electric' recorded at Fishermans Room, Berlin, Spring 1990. Track 1 recorded at Berwick St Studios and Rak; track 3 recorded at Pacific Studios; track 7 recorded at Sarm West, CTS, Fishermans Room, Berlin; tracks 8, 9, 10 recorded at Sarm West Studios. Thanks to Stevo, Rob Dickins, Michael Rosenblatt, Lee Kavanagh, Martin Watkins and thank you to everyone involved in the making of this LP. Track 10: Carlin Music Corp.
℗ 1991 Warner Music UK Ltd. © 1991 Warner Music UK Ltd. Some Bizzare logo features on both artwork and disc. 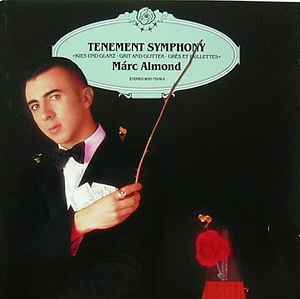 Marc Almond credited as Márc Almond on front cover and disc. Marc may not have liked it at the time, but this is probably his last great album. Love it!